Late last year we posted about Apple’s new return policy that went into effect across all of the various iTunes stores to fall in line with updated consumer protection regulations. 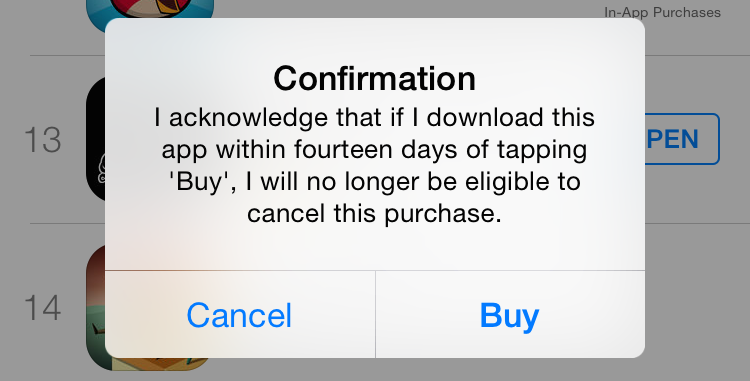 In a nutshell, people using the App Store, buying Music or Movies from iTunes have two weeks to get an instant no questions asked refund. The new policy was debated both in the article comments as well as in a thread in our forums, and few people were very happy about it. Apple definitely made sure to mention in their updated iTunes guidelines that this refund only could occur before the piece of media was downloaded, but that didn’t seem to be the case in actual practical use, as folks could just wildly download stuff and ask for refunds while keeping the app on their devices. This, of course, like all generous return policies seems to have been thoroughly abused both by people just going wild buying then returning things while retaining a copy and media outlets publishing guides effectively telling their readers to abuse it. (Under the caveat that you shouldn’t, naturally.) We suspected that like most places, Apple maintains some kind of blacklist for rampant returners. It’s why Best Buy asks for your driver’s license, the return process exists for valid reasons, not the actual reasons of “I just wanted this for free" in the case of the App Store or “I just wanted to borrow this" from Best Buy. Per iDownloadBlog, one of their readers who admits abusing the new iTunes return policy has since been greeted with a warning telling him that he’s no longer eligible for returns. They don’t mention how many returns it specifically took beyond said reader spending $40 and getting $25 refunded. That could be as high as 25 different refunds or as low as one refund, it’s hard to say without more information. Either way it’d appear that the initial fears people had regarding rampant return abuse isn’t as significant as we originally thought. As expected, serial refunders get their privileges revoked. I’d guess it takes far fewer than 25 different returns in a short period of time to trigger this popup, but, either way- If you were abusing the new iTunes return policy, now is a good time to stop as you may find yourself in a situation of having requested so many bogus refunds that when you’ve actually got a valid reason for one you can’t get it.